US hi-fi speaker company Axiom Audio has launched a new compact subwoofer designed for smaller rooms. The EP400 DSP active sub combines a 500W amplifier with an 8-inch long throw woofer to deliver bass down to 23Hz (20Hz is the lower limit of human hearing). Yet the box is only around the same size as a compact speaker, according to the company. It measures 266mm (w) x 349mm (h) x 422mm (d). Key to the EP400's performance - Axiom says - is the presence of a digital signal processing (DSP) chip that manages to deliver 116dB (that's aircraft taking-off loud), while at the same time delivering smooth, tuneful bass. Axiom says the EP400 is ideal for use as a bass generator for classical and rock music as well as movie soundtracks. 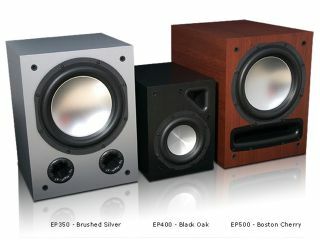 The sub is available in four different finishes for £774, including delivery, VAT and customs charges. Axiom offers a 30-day return policy if you're not satisfied with your purchase.